Description: From the pedigree Boston collection. You are invited to a Duel to the Death between Rittmeister Von Hammer, a.k.a. The Enemy Ace, and the "One-Eyed Cat" in "The Hunters -- and the Hunted!" Early 5th app. 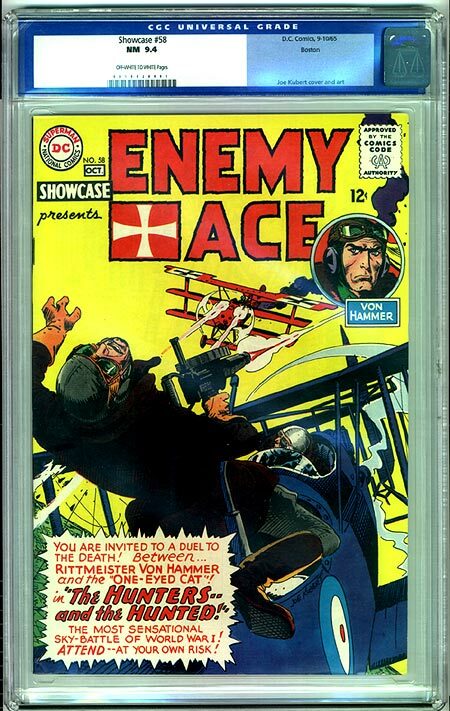 of Enemy Ace with vintage cover and story artwork by the legendary Joe Kubert. Stunning, near flawless book has a eye-poping banana-yellow cover, beautifully accented with rich ruby reds and mirror-like gloss. Book is perfect flat, clean and very tight with a super sharp spine, no staple stress at all, clean edges, perfect centering and very fresh paper. Superb in every way possible!